The best advice I ever got on co-writing was from Stan Webb, my first professional co-writer. 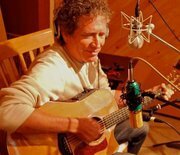 When Tom Casey, a VP at SESAC in Nashville, set the appointment up for me, he asked Stan to talk to me a bit about the Nashville co-writing process, a process that dominates the songwriting culture there. I was waiting in the SESAC writer's room with my notes and titles, some complete lyrics, song ideas, and I was feeling nervous. I, after all, am a big-time Professor at the biggest time music school in the world - Berklee, where I teach lyric writing. What if I can't come up with anything? What if he thinks all my ideas are dumb? They don't look too good to me right now either... What if he thinks I'm a fraud? Not only would that humiliate me, but it would put my students' credibility in question too, and it'd be all my fault. Why am I here? Maybe I should leave while there's still time. Couldn't I say I have food poisoning? Too late. The door opened and there stood Stan Webb, my co-writer for the day, a guy with hits. Stan is a burly guy. He looked a bit shaggy, wearing bib overalls, a tattered t-shirt, and work boots, looking like he'd just come off the farm (which, in fact, he had--he owns one, bought with songwriting royalties). He came in and did something curious: he shut the door, re-opened it, shut it again and then pushed hard to make sure it was closed. Hmmmm. Was he worried about folks listening and stealing our good ideas? I was deeply concerned just with having a good idea. It would have been a relief to have an idea good enough that a secret listener would want it. He sat down opposite me on a couch and seemed to size me up. He grinned and said, "Is that door closed?" Yikes. "Yes it is," I answered carefully, not knowing where he was going with this. Was it a secret initation? "Good, I'm glad it's closed," he said, "because you can probably tell by looking at me that I'm gonna say some of the dumbest things you've ever heard." I stayed quiet. I was more worried about what he thought of me. He went on, "And if you do your job right today, you're gonna say some of the dumbest thing I ever heard, professor or not." "No doubt there," I thought. He grinned again and said, "But, as long as that door is closed, nobody needs to know how dumb both of us are. I won't tell if you don't." He told me that he hoped I didn't mind, but Tom had asked him to talk to me about the co-writing process in Nashville, so he wanted to tell me just a couple things before we got going on a song. I told him to take his time. He said, "SAY EVERYTHING that comes to your head. Say it out loud, no matter how dumb it is. Don't censor anything. If you say something really dumb, you might give me an idea that's not quite as dumb. And then I might have a decent one that gives you a better one that gives me a great one. If you'd never said the dumb one, we would never get to the great one." "So that means that we'll never say "no" to each other. A co-writing room is a "NO" FREE ZONE. If you say something and I don't like it, I just won't say anything. Silence is a request for more, more, more. It says 'just keep throwing stuff out there.' When either one of us likes something, we'll say YES. Otherwise, just keep going." We had a great writing session. I lost my fear of looking like a fool. I came up with a lot of dumb ideas, and my dumbest idea of all led us to the best part of the song. We really did say everything. And the silences were golden - what a great way to ensure that we always get the best out of each other: nobody has to defend anything, and the only ideas that make it into the song are automatically ones we both like. The "NO" FREE ZONE gets the best out of both writers: there are no arguments, and there never needs to be compromise. I've always been grateful to Stan for his wise advice that day. It helps me every time I co-write, but also every time I write. My inner critic (most frequent co-writer) has also learned to abide by the "NO" FREE ZONE. And Stan's words still echo in the songwriting classrooms at Berklee College of Music, where literally hundreds of students have worked in the "NO" FREE ZONE and have had great co-writing experiences because of it. I've added some advice of my own to Stan's, because, in Berklee writing classes, we talk ABOUT writing a lot. Lots of process, lots of techniques. And it really helps their writing, learning about what goes into it - what tools are available. My students learn to talk about writing very well. They are good technicians as well as good writers. Thus, my advice: never talk about writing in a co-writing room, especially about technique. You're supposed to be writing, not talking about it. Stay inside the song, inside the characters. Don't run away to the intellectual level. Most people are tempted to talk about those wonderful technical effects in their lines - assonance, rhythm, deep thoughts or metaphors-- out of fear -- to cover their bases and try to dress up what they're afraid might be a dumb idea, in academic robes. A dumb idea is still dumb, even with professorial robes on. Just write. And write fearlessly. One final thought: in terms of SAYING EVERYTHING, I hereby grant you permission to write crap. Lots of it; all the time; the more the better. Remember: crap makes the best fertilizer. Pat Pattison is a professor at the famed Berklee College of Music in Boston, MA, USA. Many songwriters have asked me what makes a winning song. As VP of development at USA Songwriting Competition for the past 14 years and I have heard winning years through the years, a winning song should be creative in both music composition aspect as well as the lyric composition. A good example is the top winning song of 2008 competition "Home" written by Jordan Zevon, Jordan Summers and Morty Coyle. Musically, it displays surprises in Chord changes and the lyrics about coming home are not the clichés of what you hear on radio. It didn't hurt the song that chorus is catchy. Another example is the winning song of the country category in 2007 "I Can Live Without You", written by Mary Danna and Troy Verges. One would think the song is about someone who doesn't want to live with another. However, there is a twist at the end of the sentence in the chorus "But I just don't want to". They have taken a love and heartache song and given a "surprising twist" in the end. Also, the bridge was short, surprising and also emotionally high (with the melody hitting a high note at the end of the melodic line) and yet sad. That song still remains a favorite at the USA Songwriting Competition. I have heard submissions where songwriters try to write the derivative songs that were number one on the charts at one time and end up being awkward. One case was a songwriter who took the entire track of Jennifer Lopez song "If You Had My Love" and wrote a similar melody to the background music, even the melodic line's rhythm was so similar. The chorus even copied the melody of the original song. Our judges thought the song has been plagiarized, let alone not being creative as the judges left the room singing to Jennifer Lopez song instead. Needless to say, that song didn't win. I realized an interesting fact that the top winning songs of the past two years have been a three-way collaboration. The winning song last year was written by three songwriters and so was the year before ("Where the Music Takes You", written by Ari Gold, Joe Hogue "JOJOHO" and Sean Petersen). That song also hit top 10 on the Billboard Charts after winning the competition. "Where the Music Takes You" was unique, it had no intro, the vocals start as soon as the music plays. The chorus was so catchy that the judges left the song singing to it. Speaking of catchy, the winning song in 2004 was written by five songwriters ("My Three Wishes", written by Patrice Pike, Wayne Sutton, Sean Phillips and Darrell Phillips). The opening hook in the chorus of the Alternative song "My Three Wishes" was accented in an off beat way that would draw the listener to want to hear more. You can tell that the song took extra effort and creativity. A song may sound nice to listen to but please note that a lot of work is being done to the song: musically, lyrically, artistically and more. Cher's biggest hit "Believe" was written not by one but six songwriters! Paul Barry, Matt Gray, Brian Higgins, Stuart McLellan, Timothy Powell, and Steven Torch wrote that hit number one in 23 different countries. Where would Cher be without this great hit song like this? Could you be creative enough write a song better as good as this or even better? Write one and submit it to us in the USA Songwriting Competition. Most creative people are terrible at business. We're all very, very sensitive and take it personally when someone is abrupt or rude as we nervously try to promote our uncertain selves. The guy who makes one more phone call, one more time, gets the meeting. The most persistent musicians are the ones with the deals. We hate hearing that because we're all looking for fairy godmothers to rescue and discover us, but Toto, there is no fairy godmother. No matter how much we want or need one, it's on each of us to switch gears and become the cool-headed champions of our own art. Nobody will ever love our work more than we do. Not our mothers, dads, wives, husbands, ex-husbands, ex-husbands twice removed, significant or insignificant others. The good news is that in my book, "How To Be A Hit Songwriter", there are three whole chapters devoted to the creative marketing your music and lyrics. And in the Fifth Edition of "How To Write A Hit Song", just published, there are two. One of the best recommendations I can make is to call, speak to and/or meet one new music person every day. Not just when you feel like it. Every day. Keep a list with phone numbers and email addresses. At the end of the year, you'll have 365 contacts. Sure, it's easier staying home under the bed, hoping hoping hoping to just mail it in, unsolicited, but you have to leave the comfort of your creative space and get out into the world where the people are you need to meet. The chances are good that the next Sony CEO won't knock on your door desperate to go potty, hoping for a diet Coke, with shaved Bavarian ice, in the bargain. Don't you owe it to your music to learn to be as good at business as you are at writing, singing and performing? When you are, you'll have the whole package. Then nobody can stop you. Molly-Ann Leikin (rhymes with bacon) is a songwriting consultant in L.A. with a house full of gold and platinum records plus an Emmy nomination. She is also a Eurovision finalist (American Idol in Europe). Three of her clients have Grammy nominations, another won an Emmy and so far, 5041 others have placed their work, with Molly's help, in movies, TV, on CD's and in commercials. When I write a song, I always write the melody first, one note at a time. While I have limited chops as a keyboard player, I do hear melodies in my head. I keep a recording device of some kind with me all the time - in my car, in my purse, next to the bed, even in the shower - so that whenever I get an idea for something, I just record it, la la la'ing. Sometimes I even call my voicemail, and sing to myself. I constantly revise the notes, going over and over and over them. You may work differently, but just remember that songwriting is a process, and what comes out in the first draft is just that - a first draft - and usually needs several more to reach the finish line. I'm lucky because I feel a little click in my gut when I know something I've written is finished. But I don't have anything to do with chords or programming until much later. After writing the single notes of the chorus, I work backwards to write the individual notes of the verse, again, one note at a time. When I am finally happy with both the verse and the chorus, I go looking for the chords to put around them. That way, I'm not inhibited by my lack of musicianship or intimidated by the technical aspects of programming. I just write the song. Once the melody's down pat and the lyric I write to the melody clicks and I have the chords that go around the notes, then I start thinking about "how do I hear this produced, what instruments do I feel, what record on the radio sounds like what I'm going for." But it all starts with the individual notes of the melody. I know from working with so many talented, developing writers that they start with too much ambition and too much technology and not enough bare simple note-by-note creativity. So if you find your melodies aren't as strong as you would like them to be, or that the marketplace requires, then I suggest you try some version of my way of writing songs and adapt it to your personality. When you change the process, you can change the result. © 2009 Songwriting Consultants, Ltd. In writing a melody, it's critical to keep your audience surprised. Since we speak English in iambic pentameter, it's natural to assume we can write in the same meter. Unfortunately, it's deadly boring. So I suggest you deliberately vary the lengths of your lines, and the number of notes in each, along with the number of lines or bars per section, to avoid your song sounding predictable. After all, it's your job as an artist to tell your audience something they aren't expecting. The range of most contemporary singers is an octave and three - the interval from middle C, for example, to the E an octave above it. If you write a tune with a range greater than that, you'll be hard-pressed to find a singer with the chops to handle it. My song, "An American Hymn", which I wrote with Lee Holdridge, was only recorded once in twenty years until Lee figured out how to revise the bridge melody, reducing our octave and five to an octave and three. Now the song is recorded at least once a month. Most hit "power" ballads, such as Daughtry's "Home," end their verses on notes lower than the ones on which the choruses start. To create tension and drama in their melodies, I urge my clients, and you, to go up into the chorus, not sideways or down. Doing the latter is like letting air out of a tire. So go up and stay up. And although some contemporary songs break the rising-into-the chorus rule, you can bet their rhythmic hooks at the beginning of and throughout the choruses are strong enough to overcome the melody's drop, and keep us listening. After the title, the tune is the most important part of the song. The way our brains are wired, the melody is the first thing we hear. If we like it, we'll stay tuned and listen for the words. If the tune doesn't get to us, it's over. Melodies need hooks. Without them, nobody will ever hear your work, no matter how brilliant the lyric. I know lyricists won't be happy to hear this, but it's true and knowledge is power. In constructing a melody, there are several guidelines to follow. I recommend to all my clients, no matter where in the world they are writing, to get to the hook/chorus, within twenty-five or thirty seconds. I advise them, and you, to keep their introductions short. The intro is usually instrumental, and the song doesn't officially start until the verse begins. So keep the intro to eight bars or less. Often writers who are in love with their software wail on and on for sixteen or thirty-two bars before beginning the actual song. Don't. Eight bars are plenty. The audience will only give you a few seconds of ear time and then move on to something more accessible. You worked hard to get ‘em. Don't let ‘em get away. If we like a melody, it usually isn't until we've heard it several times that we finally hear the words. You can write a brilliant lyric, but if it has a weak melody, nobody will ever hear any of it because the tune hasn't done its job. The function of the melody is to grab us in an unguarded, primitive, totally emotional state and hold our attention long enough for the more civilized and intellectual lyric to take hold and give us some words to sing. Leikin's Law is give them what they want. Express yourself as only you can, absolutely. You have a fingerprint as a writer that nobody else has. But don't expect a lyric to do the melody's job. l. A great idea, one I have NEVER heard before. 2. A co-writer who is as committed as I am to making great music. This isn't a hobby. It's a life. 3. What can a potential co-writer bring to the table that I can't? If I write music, how are his lyrics? Just okay? Or do they tell me something new, something I've never heard before. How are his tunes, his production chops? Passable? Or cutting edge and original? How's his voice? Will his vocal fingerprint turn heads? Y'gotta turn heads, no matter what you contribute to the project. 4. Is this potential co-writer reliable, respectful of my time and talent? And does he/she really have a magical gift to enrich the literature of music, rather than just filling up letterhead and mp3's by recycling what other people have already said/sung? Bottom line: don't settle too easily. Honor your work. Respect what you do and never stop looking for the best people, the very best, not just the closest or the most available, on your creative team. They are out there looking for you, too. 5. Where do I find them? Fifty times a day, every day, I hear from bands, lyricists and composers passionately looking for the missing pieces of their songs. Once I've heard what you do, in a consultation, I've been extremely lucky hooking up writing teams. When you're ready to set up a consultation, I can help you, too. Molly-Ann Leikin (rhymes with bacon) is a songwriting consultant in L.A. with a house full of gold and platinum records plus an Emmy nomination. She is also a Eurovision finalist (American Idol in Europe). Three of her clients have Grammy nominations, another won an Emmy and so far, 5041 others have placed their work, with Molly's help, in movies, TV, on CD's and in commercials.The author of "How To Write A Hit Song" and "How To Be A Hit Songwriter", Molly's website is www.songmd.com and her toll-free number for the USA and Canada is 800-851-6588. You can also reach her at songmd@songmd.com.